The Port Authorities in China want to adopt as standard in ports and harbours the navigable water depth; many ports in China have a problem with silt, liquid mud, deposited by rivers. Liquid silt has the characteristic of prohibiting navigation if it reaches a certain density. In most ports, silt with a density of 1,250kg/ltr and more is not navigable. The depth at which this density is found is called the Nautical Depth. To determine the Nautical Depth, instruments are needed to measure the density of the mud and to determine this datum for safe navigation and for dredging purposes. In addition, it is in some cases required to know thickness and density of deposited mud layers in lakes and rivers, the latter in the context of studying and removing polluted silt layers. After passing extensive acceptance trials in fieldwork since they began in September 2002, a new system is presently in use for determination of the Nautical Bottom in the Port of Tianjin and characteristics of the polluted silt layers of Lake TaiHu in China. Results of the tests and experience with the system are presented here. The Tianjin Survey and Design Institute of Water Transport Engineering, responsible for hydrographic surveys in the Port of Tianjin, decided to use the Nautical DEPTH survey system developed by STEMA Survey Services bv of The Netherlands. The system consists of the DensiTune insertion silt density meter and SILAS, an acoustic reflection measurement software package. The SILAS software was designed to measure the intensities of sub-bottom reflections caused by sub-bottom sediment. Reflections of acoustic signals originate from changes in density - PIANC St. Petersburg -20gr/ltr- Initially, the software was developed to be used for seismic surveys with sub-bottom profilers, boomer systems and sparkers. Also, the low frequency of any hydrographic echosounder proved to be an excellent source to be used for the determination of the Nautical Depth. The problem, however, is that from these recorded acoustic reflections only the variation in density can directly be established and not the absolute value. It is also not known whether variation represents an increase or a decrease in density. To determine these anomalies, sampling of the sediment is essential. In consolidated material a coring is sufficient. In case of liquid mud, an in situ density measurement will solve the problem. The DensiTune provides direct in situ density information, which can be imported by the SILAS software for calibration of the measured intensities to allow computation of correct values of density and depth. The measurement system of the DensiTune probe is based on the ‘tuning fork’ principle. One of the legs of the fork is sent into vibration with a specific frequency, the other leg responds with a frequency which depends on the density of the medium (sediment) into which the DensiTune is inserted. The measurements of the tuning fork are physical measurements which do not affect the environment and which provide vertical density and viscosity profiles in liquid sediment layers while being lowered into the silt. Delivery of the measurement systems and users instruction in September 2001: seventeen (17) acceptance tests of the Nautical DEPTH survey system in the port of Tianjin were performed from September 2001 till August 2002. Results of the various measurements are summarised and presented in Figure 1 and Figure 2. Xingang, the port of Tianjin, situated near the mouth of the Huang He (Yellow) river ranks among the biggest container ports of China. According to China Ports Yearbook 2000, Tianjin Port belongs to the top five harbours in China with regard to total cargo handling, import/export cargo handling and container volume handling. In November 2001 the throughput capacity of Tianjin Port broke the 100 million tons record. As a result, Tianjin Port joined the top twenty ports in the world. Tianjin Port is to invest 1.5 billion RMB (200 million US$) to increase its capacity. The money will be used to build and upgrade infrastructure, including the second-phase construction of a navigational channel for large vessels with a capacity of 100,000 tons. Meanwhile, the port will continue to build its deep-water channel. This year the port will also build two docks for bulk goods and upgrade a dock for containers. After acceptance of the system by the Port of Tianjin Authorities, the system has been put permanently into use to define the Nautical Depth, which in the Port of Tianjin is defined by the 1,200kg/l density level at a depth of 14,oom below Chart Datum. In the navigation channel the Nautical Depth is monitored throughout the year by hydrographic surveys using the 33kHz frequency of a dual frequency single beam echosounder, hydrographic survey software for positioning and data collection and synchronisation of the SILAS software for recording acoustic reflection data At positions of interest, in situ density measurements are carried out with the DensiTune density probe to determine density parameters in the silt layer. The results of the density measurements are fed into the SILAS data processing software to establish a 3D model of the position of selected density levels in the silt layer. Lake TaiHu, situated 60 kilometres West of Shanghai, is important for the fresh water supply of Shanghai, Wuxi, Hangzhou, Suzhou and the region, in which thirty to forty million people live. Fresh and clean water is not only important for the potable fresh water supply but also for the fishing industry, agriculture and the textile industry (silk). It is known that the silt in the lake is polluted and has to be dredged to remove the sediment. An additional advantage of dredging the polluted layers is the creation of extra storage capacity in case of flooding of the River Yangtze. The lake has a surface of 1,400km2 and varies in depth from two to fifteen metres. The bottom mainly consists of consolidated silt with a thickness of three to seven metres. The sediment appears to be polluted. Investigations are underway as to how to dredge the lake to remove the polluted silt. 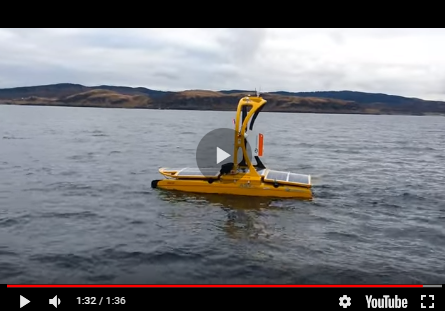 The Survey and Design Institute of Water Transport Engineering has tested the systems in the lake to investigate the subbottom characteristics and map depths, thickness and density of silt layers. For practical reasons, the investigation was limited for the time being to the north part of the lake near Wuxi. When it was decided to use the DensiTune/SILAS system of Tianjin harbour for this project, the system was transferred to Lake TaiHu and subjected to similar tests as in the Port of Tianjin. Results were comparable with the results in Tianjin and more than acceptable for the Lake TaiHu project.